A yummy twist on roast pepper hummus – so easy to make! I first began experimenting with hummus ingredients as a student when I couldn’t afford tahini. Whilst the traditional middle eastern dip of chickpeas, lemon, garlic and sesame that is hummus has been eaten for millennia, it’s also a great formula for experimenting and using as a blank canvas for your own ideas. At its most basic you can swap the garlic for chilli or smoked paprika or add a handful of olives. Today’s variation uses leftover pizza toppings. Yes, a non vegetarian hummus may sound heretical – but it tastes divine. You don’t need nine slices of chorizo, that’s just what I happened to have. Even a stray slice of salami left over from sandwich making can transform your hummus. It might seem a faff to spend an hour roasting peppers for this – but they are useful in so many things I’ve taken to roasting more than I need and putting them in the fridge or freezer. You can use them as pizza toppings, in a roasted red pepper salsa, or this roast red pepper sauce. As an added bonus, they need very little attention whilst roasting. Another tip, if you’re an avid humus muncher who doesn’t use much tahini – it tastes just the same with peanut butter. 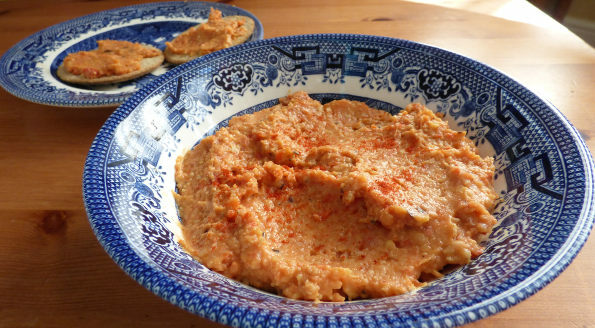 This roast pepper hummus uses peanut butter, but feel free to use tahini, or other nut btters. Heresy again, I know, but it works! For more hummus ideas, see how to make hummus, hummus vegetable pie and refried bean style dip. Deseed the pepper and chop it into chunks. Drizzle with oil and load into an ovenproof dish. Cook on gas mark 6 for around an hour until it's soft with bubbling skin and charred edges. You may need to stir once or twice during cooking. When the pepper has cooled place all hummus ingredients in a blender and whizz until smooth. If it looks too grainy you may need to add a small amount of water or oil. Thanks, glad you like it! Do let me know how you get on if you try it! Adding chorizo sounds interesting, I wouldn't have thought of that. And what a good idea roasting extra peppers and freezing them or just chilling them. I love roasted pepper, so would be sure to use them up quite quickly. Thanks! I hate to see things wasted. I know what you mean about roasted peppers. They're so sweet and so versatile.